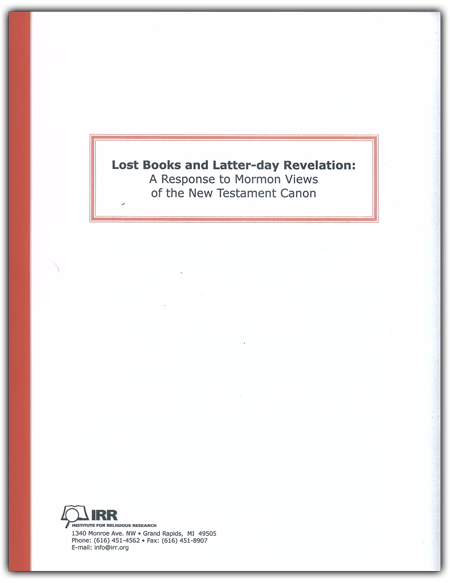 Lost Books and Latter-day Revelation is a scholarly paper that examines the four main reasons why the LDS Church rejects the historic Christian position that the 27 New Testament books, along with the Old Testament, are the final and complete revelation of God. Considered in logical order, they are: (1) Some of Jesus' teachings were never recorded and have been lost, (2) immediately after the apostles, apostate Christians removed some books or parts of books from the original New Testament writings, (3) other inspired books were rejected in the canonization process, and (4) God continues to give new revelation through latter-day prophets. Each of these objections are carefully evaluated and dismantled revealing the errors in LDS teaching and firmly establishing the reliability and completeness of the Bible we have today.